I noticed a discussion about spelling mistakes on Dutch coins in another thread, and that gave me the idea for a thread discussing spelling and/or grammatical mistakes on coins. 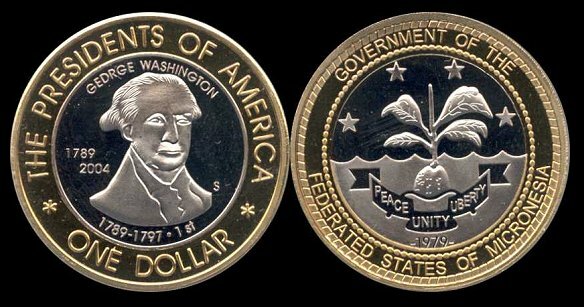 One glaring example I can present would be coins of the presidential series minted for Micronesia. I'll post some pictures if I can find them. If anyone else has examples, I'd like to see them! This is a rather ridiculous mistake. It says "GEDRGE" where it should "George". This is another mistake. 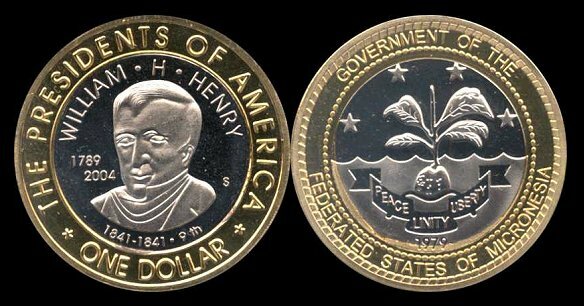 It says "William H. Henry" where it should say "William Henry Harrison" or "William H. Harrison". This is probably the biggest mistake of the three. It says "David D. Elsenhower". First of all, David is the middle name, not the first. Secondly, it should read "Eisenhower", not "Elsenhower". The correct spelling would be "Dwight David Eisenhower" or "Dwight D. Eisenhower". Obviously, whoever designed these coins did not speak much English, which begs the question, why did he/she design these coins? 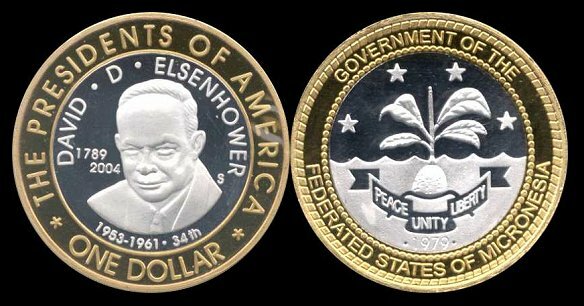 It seems that with all the people in Micronesia, they could have found someone who could speak or read enough English to spell the words on their official coinage correctly. You can view the entire Micronesia presidential series here. Does anyone know what the "S" mintmark stands for? I can't think of where that could be. I know it's not San Francisco! It depends on what you call a spelling error. Is "stiver", instead of "stuiver" a spelling error or the recognition of an Anglophone that he's unable to pronounce the word properly and he is therefore helpfully and completely free of any charge changing the spelling? What to say about the denomination "cash" on Chinese coins, when the correct pronunciation is more like "kas" and "cash" is another British invention? How about the consistent use of "cent" for the plural on euro coins, which should actually be "cents" in French and the way the Irish pronounce English, but "cent" in German or Dutch? I think the Euro coins should be language-neutral like Swiss circulating coins. For instance, they should use "5 Euro C." instead of "cents". That's not a solution, I am afraid. First, eurocent is wrong (though helpful to distinguish them from other people's cents), second, some euro countries use different characters. Greece is the only one now, but one day, Bulgaria will be another example. The fact of the matter is that the French happily use centimes, the Spanish centimos and the Irish cents while the Germans and the Dutch use cent (each pronouncing the word differently) and nobody cares. The EU is not based on the melting pot model. I understand the Greek dilemma. I suppose the only real solution would be to use a Euro cent symbol instead of lettering. The numerals are universal amongst the Euro countries, so that shouldn't be a problem. I'm not aware of any spelling errors on Indian Coins. However Bank Notes issued both during the British occupation as well as Republic India bank notes have had spelling error. And what about the Rs 50 note that had the flagstaff on the Parliament building but no flag. Not a gramatical mistake nor a spelling error but a blunder in any case. Notice the incorrect spelling of the word "spot". The phrase comes from a letter by John Adams Dix (then secretary of the Treasury) to a Revenue Cutter named Caldwell. Thanks for the info. Will need to keep an eye for this one. 2. Konstantin's 1 rouble 1825 where the name of the emperor was written without letter Ъ (КОНСТАНТИН instead of КОНСТАНТИНЪ) - just like in modern, post-revolution orthography. Abhay's coin clearly shows a dot (or is it a diamond?) below the date. A product of Noida / Mumbai mint? or was this one of the foreign mints who were subcontracted for producing these coins due to severe shortages around the same time? The image of 10 Paisa coin with the dot is from the normal "BHARAT" coin. I just checked and there is no dot on the "MARAT" coin. So I think, what Aditya says is correct. Even the catalogue mentions 1988(C) and 1989(C), (C) for Calcutta.